Today I got the chance to see the new Pixar movie Inside Out and I was not in the least disappointed. You’ll hear more about that in the next post. 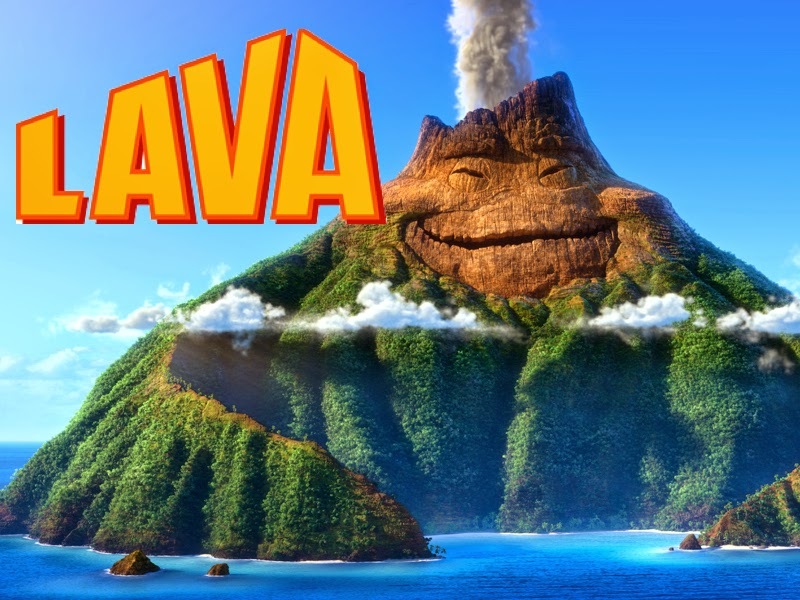 But let’s not let my enthusiasm for Inside Out allow me to forget the delightful little short they had before the feature film called Lava. Directed by James Ford Murphy Lava is a simple short that is a love letter to Hawaii and Hawaiian music (you know I will love that!). The artwork in Lava is gorgeous. We get wide swooping shots of both the Hawaiian mountains and the beautiful ocean. We see whales jumping up out of the water and everything sounds so peaceful and serene. As we dive in closer we see that the volcano has a face and we learn he is singing a Hawaiian song. 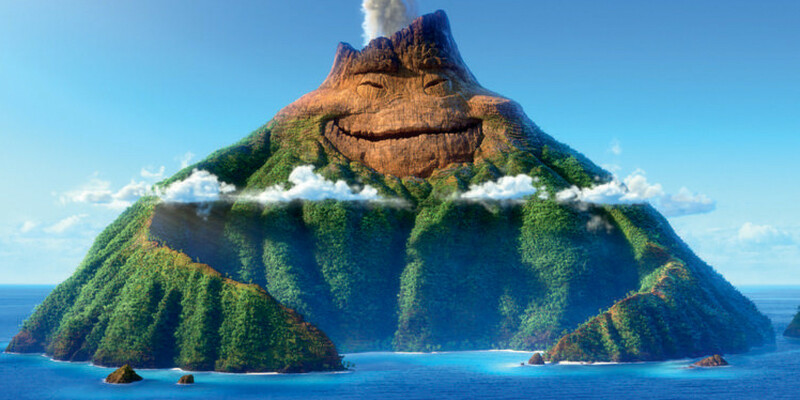 The volcano named Uku is voiced by Kuana Torres Kahele and the song he sings is a sweet plea to the Island Gods to allow him to find the love he see’s all around him. I love Hawaiian music so that was great! I like that the volcano looks like a jolly old soul but he kind of reminds me of Jabba from Return of the Jedi! Luckily his song is heard by another volcano but it is buried deep in the ocean. 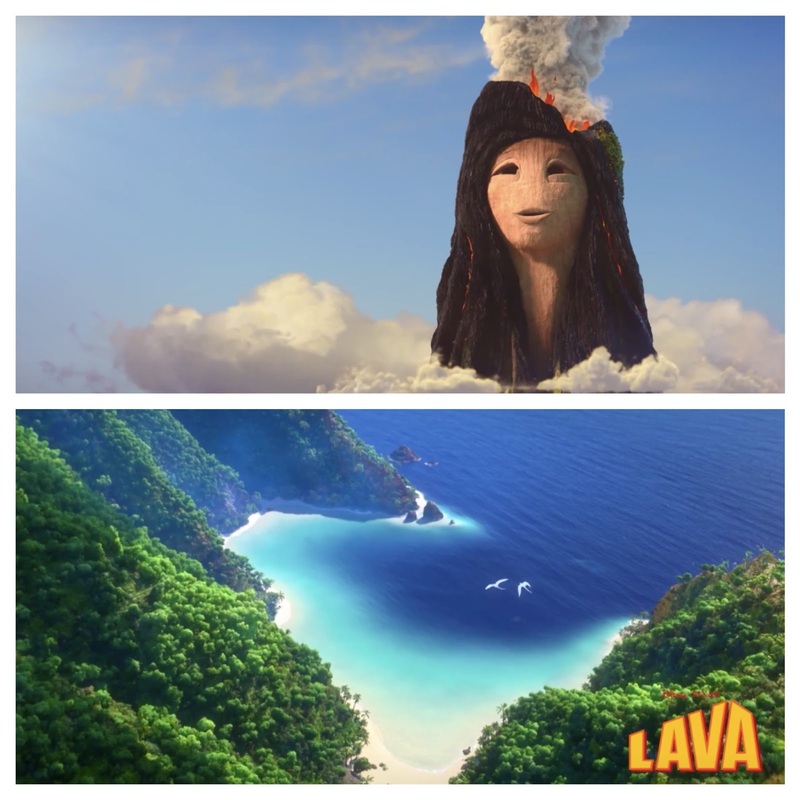 The female volcano is named Lele and she begins singing her own song to Uku. It’s a peaceful lovely duet. Like I said this isn’t one of their more groundbreaking shorts but I did enjoy it. Anytime I can look at Hawaii, hear Hawaii, think about Hawaii I’m a fan. It’s a sweet little love story. Can’t go wrong with that. I’m glad you were not disappointed by Inside Out! That gives me renewed hope for it. Would you say it was better than Up or just as good? It blew me away. It certainly is as good as Up and you full well know what high praise that is coming from me. I LOVED it so much. I couldn’t sleep so just posted my review. It also has my video link for my youtube review if you like that. Wow, I never expected you would say that! This is something to look forward to. Would you say it’s one of your new favorite movies, even if Up is still #1? I tried watching Inside Out but I had to leave. Some girl tried to talk to me, asking nosy questions like “How old are you?” and introducing me to the people with her. Can you imagine anything more irritating than that? What would you have done if you had been in that situation? I probably would have shushed her at first and then found somewhere else to sit or told management that someone was being disruptive. Sorry you had such rotten luck. Yes, of course you would have done that, because you have all those friends and everyone else is just a stranger. You have an awareness that at one time they were just random strangers, but that was such a long time ago it’s not possibly relevant anymore. You don’t know what it’s like to wish for years someone would take an interest in you, try to break out of the “silent statue” mentality society has mindlessly drilled us into. And the only reason I haven’t instigated it, tried to start a friendly conversation myself, is because I know people would react by doing exactly what you just suggested and I can’t stand rejection. I did report them to management and try to find a new seat because I knew that’s what someone would do to me if I ever got up the nerve to talk to a complete stranger like that. I actually do know what it is like to have no friends. Stop judging me so harshly. I was brutally bullied for over 2 years and the teachers did nothing about it. They claimed there was nothing they could do about it so I was pushed into fountains, had my dress lifted up so everyone saw my underwear, was told I looked like a dog, horrible things. Having and maintaining friends is something that has taken great effort on my part- not something that just happens naturally. I work harder at that than almost anything else in my life and try to be open to talking too and interacting with anyone because I know what it’s like to be the lonely bullied one. Anyway I hope you get another chance to see the movie. Take care. I’m sure that’s exactly what the girl in driver’s ed class thought of me, too, for being someone over 16 in driver’s ed and copying her e-mail address off the form to send her a friendly message hoping she wouldn’t be sick for class next day. That was obvious with her “Oooookay” when I told her I hated every second of being homeschooled for 12 years in response to her saying on her Goodwall profile she was a senior in high school and “pretty much loathing every minute of it”. Because she and the other girl who didn’t know each other at all could go on and on about facets of the public school system just because that was the one thing they had in common. They had friends, and they still wanted something better with their lives and didn’t have a clue what they were looking for, and were too reserved to admit it to anyone who took interest. “I’m not liking it that well”. I was just supposed to get on board and join in conversation I couldn’t relate to and had nothing to add to, in any case. I tried to subtly suggest we could exchange contact information on the last day of class, but noooo. I tried to say “Goodbye” and that was too much apparently. Sierra said “Goodbye” in the same amused and exaggerated way, but Laurel just sat there glaring, gritting her teeth, wanting to get out of that classroom and out of that weird creep’s life as fast as she probably can. Because it’s so easy to dismiss someone else as such “weird people” when you can just write them off and have nothing to do with them, but they have to go home and live with themselves for the rest of their lives, and they are incapable of walking out of their skin and becoming someone different. It’s so easy to dismiss someone else as boring, uninteresting, and weird, but why can’t they do the same thing? If no one cares less about me and my life, if I’m not interesting enough to get to know, and if everything I do to reach out to people has to be rejected and humiliated, why should I care about myself and why do I have to wake up indoctrinated in my own skin every morning of every day? How is that fair? Whoa. You make a lot of judgments about me and I’m actually a pretty thoughtful considerate person. It’s a question of time and place. A crowded movie theater is not the place to strike up a new conversation. There is nothing demeaning about telling someone to please be quiet during the movie. If they want to talk after the movie that’s great. I am very open to meeting new people and have many friends who are socially awkward and take great effort to get to know and love. You asked me for my opinion and gave you several responses that I felt were appropriate. I do not think I deserved to be lambasted in such a way for my response. You do what you feel is right. When I said about weird people is it does seem like you have a collection of stories of unusual interactions with people that I’ve never had before. I’ve been to thousands of movies and never once had someone try to talk to me or acknowledge me in any way. From that perspective it was abnormal or weird. I know many weird people and have been bullied in my past so badly I had to be removed from school. Do not assume I am some popular girl who has no idea what it is like to not have friends. I’ve worked very hard to develop relationships in my life and become a good friend. I must admit I’m a little hurt with all we’ve conversed over that you’d attack me in this way publicly for answering a simple question. I would ask someone talking to me in a movie to please be quiet and if she’s offended that’s too bad. It’s not the time or place to start a friendship. Well have a good day. What’s strange is it wasn’t even the first time this happened. A group of kids tried talking to me at The Hunger Games, too, but we were the only ones in the theater then and it seemed they were just trying to kill off boredom before the film started. The thing is that it’s easy to agree with you on paper, but what I’m finding more and more to be true is that you can’t force other people to accept your values and way of looking at the world. It never works out for you and if it does it shouldn’t. Also I should have mentioned that they started the conversation before the movie actually started. And this is probably a result of the generation gap. People in their 30s don’t tend to try to make new friends or reach out particularly in strange venues while at my age people are still social and try to form bonds. Probably true. :). Good luck in the future if it happens again. What I should explain is that for me, “offended” means far more than it does for most people. It means anger for years, insecurity, and a lack of willingness to do anything extroverted or make any decision I am even slightly afraid to, even if it would probably improve my life for the better. Also there are 2 phrases I hate more than any others: “Too bad” and “I don’t care”. We all have our triggers. I did my best to answer your question and will continue to do so. Take care. Anyway I understand where you are coming from. Don’t worry. What are some places you think it would be appropriate to try to strike up a conversation like that? It’s a good idea. It would be better if I only got invited to parties more often. It seems people are not engaged with some other activity very rarely, though. If we were to bring this to the topic of movies, I am amazed you didn’t like The Breakfast Club. It was one of the most inspiring, relatable, insightful, and intelligent films I have seen. Definitely compared to most teen films which are brainless raunch-fests. Especially since it probably wouldn’t be able to happen with today’s kids looking at their phones and iPods all day long. I mean the principal would have taken those things away likely, but they brought drugs and cigarettes into detention so how would that stop them? It’s not that I thought Breakfast Club was awful. It just wasnt my favorite like it is for others. I agree it has some strong writing but I felt the characters were very simplistic (the jock, rebel, nerd, pretty girl) which made them predictable. Definitely better than those raunchy movies. I just didn’t love it like some of my friends. But the whole point was founded on them being stereotypes. As soon as you see a person, you judge them. This doesn’t just apply to the staff at school, but among other students. That’s how peer groups develop in school. When considering people you want to talk to and get to know at lunch break, you subconsciously rule people out based on an impression you got of them not being the kind of person you like, found pleasant, or was interested in. That’s what The Breakfast Club was about. Brian even lists off the stereotypes you mentioned at the beginning and end, saying “That’s how we saw ourselves this morning. We were brainwashed”. He specifically spells out that they have all those qualities inside them, in the end. The film shows what happens (or should happen) in real life: we see a person, think we have them figured out in the most convenient stereotype, then the layers are peeled back as we get to know them and realize what makes them the way they are and that they are complex human beings with issues and emotions just like ourselves. That’s what makes the film unpredictable. Well I didn’t like Bender and Claire ending up together. I thought that was rushed and unrealistic given his sexual harassment of her throughout the film and admission of philandering. I don’t think it’s entirely realistic that they would be so open with each other as they are in the end but I think it works as a motivational piece. The film is basically as realistic as it could be and carries a powerful message. I think anyone could learn something from it if they took the time. I remember once a guy responded to my complaint that we couldn’t socialize in class by saying “Oh, yeah, the trick is trying to push what you can get away with”. I could never be so unafraid of consequences and outgoing as that. But he has many friends, seems like a happy confident person, and graduated successfully with a bright future ahead of him. So clearly you can break the rules and get away with it. I’ve just never had the courage to try because I’m not the kind of person who can pull it off usually. What do you think of the idea that this film’s story and plot are derivative of the Michael J. Fox 1991 film Doc Hollywood? I meant Cars. Sorry I left this comment on the wrong article. Ah, ok. I haven’t seen it but I have no problem with plots getting reused and recycled as long as they bring something new and interesting to the project. I’m interested in seeing this one. I think you’d like the sly grin of Lava. Just saw this a couple hours ago and loved it. Made me bawl my eyes out, as did significant portions of the movie that followed it. I don’t understand the hate for it coming from certain quarters. While this is so very much Pixar, it also struck me as a call back to Disney of long ago. Disney at one time brought to life inanimate objects like none before them, combined with simple emotional stories. Johnny Fedora and Alice Bluebonnet is one that comes to mind, and I know there are others. Good point about Johnny Fedora. Most people have been very positive. It’s a very simple short but I really enjoyed it. I think some people need a more defined story where others like you and I can enjoy a sweet simple concept. There’s always going to be people with different tastes out there. I was touched by it as well and the second time I liked it even more. I have purchased the song and love it. Welcome to the blog. Check it out. I’m having so much fun right now reviewing the Pixar films and shorts. 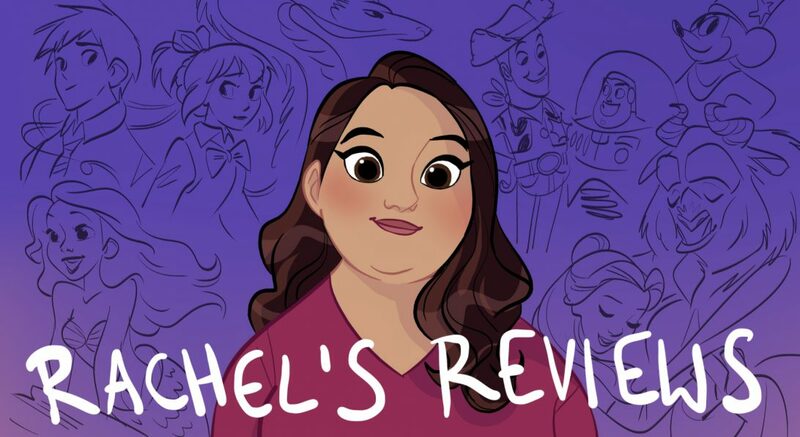 Pingback: Pixar Review 24: Partly Cloudy | Reviewing All 54 Disney Animated Films And More! Great review! Yes, this was definitely a breezy short for Pixar. Not my favorite, but still charming. Pingback: Pixar Review 34: Sanjay’s Super Team | Reviewing All 54 Disney Animated Films And More! Pingback: Best of 2015 Animated Shorts | Reviewing All 54 Disney Animated Films And More!